Gordon Vierck is a Project Manager at Luse Thermal Technologies (www.luse.com), a NIA Union Contractor member company and a mechanical insulation contractor in Chicago. Family-owned and operated since 1923, Luse has extensive experience servicing hot and cold mechanical systems across all major commercial and industrial market segments. Mr. Vierck can be reached at gvierck@luse.com. 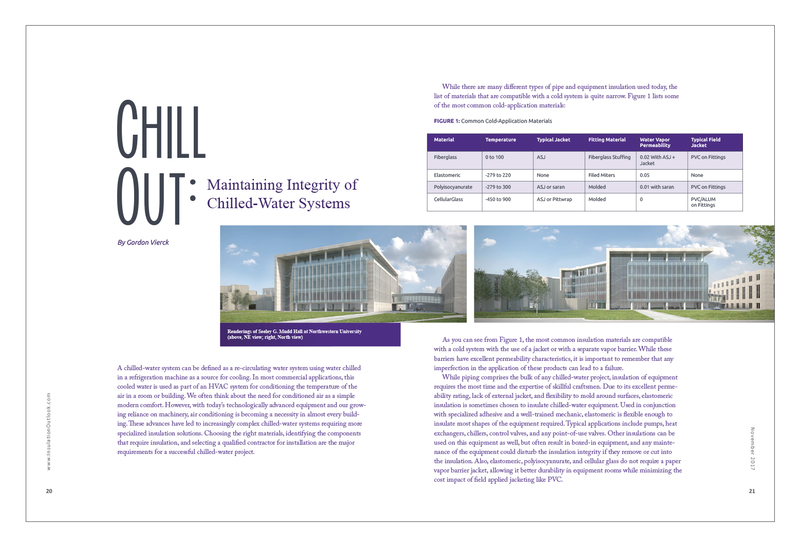 A chilled-water system can be defined as a re-circulating water system using water chilled in a refrigeration machine as a source for cooling. In most commercial applications, this cooled water is used as part of an HVAC system for conditioning the temperature of the air in a room or building. We often think about the need for conditioned air as a simple modern comfort. However, with today’s technologically advanced equipment and our growing reliance on machinery, air conditioning is becoming a necessity in almost every building. These advances have led to increasingly complex chilled-water systems requiring more specialized insulation solutions. 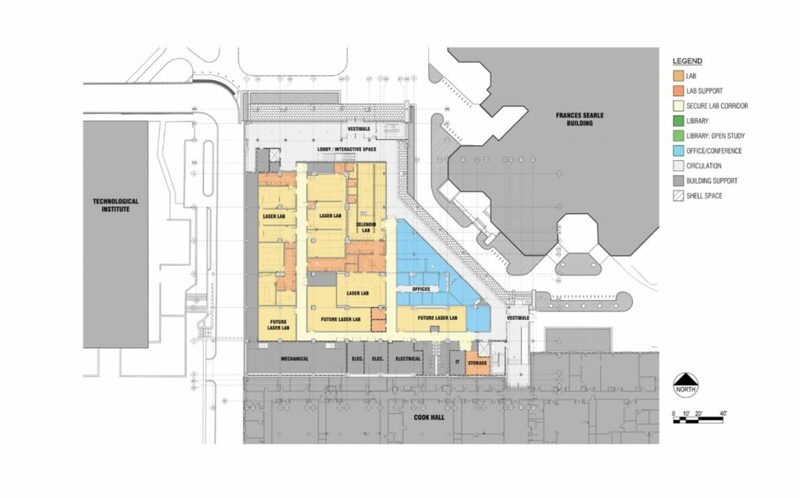 Choosing the right materials, identifying the components that require insulation, and selecting a qualified contractor for installation are the major requirements for a successful chilled-water project. As you can see from Figure 1, the most common insulation materials are compatible with a cold system with the use of a jacket or with a separate vapor barrier. While these barriers have excellent permeability characteristics, it is important to remember that any imperfection in the application of these products can lead to a failure. While piping comprises the bulk of any chilled-water project, insulation of equipment requires the most time and the expertise of skillful craftsmen. Due to its excellent permeability rating, lack of external jacket, and flexibility to mold around surfaces, elastomeric insulation is sometimes chosen to insulate chilled-water equipment. Used in conjunction with specialized adhesive and a well-trained mechanic, elastomeric is flexible enough to insulate most shapes of the equipment required. Typical applications include pumps, heat exchangers, chillers, control valves, and any point-of-use valves. Other insulations can be used on this equipment as well, but often result in boxed-in equipment, and any maintenance of the equipment could disturb the insulation integrity if they remove or cut into the insulation. Also, elastomeric, polyisocyanurate, and cellular glass do not require a paper vapor barrier jacket, allowing it better durability in equipment rooms while minimizing the cost impact of field applied jacketing like PVC. Ductwork is another important piece of the insulation envelope for a chilled-water system. The result of a failed vapor barrier in ductwork tends to show itself in the most public spaces of a building. Ceiling structures often point out the failure of insulation with water marks. While these marks can cast a negative image for any office, home, or other facility, water can also lead to mold and added expense for remediation. Cooling coils, diffuser boxes, and flex duct connections are the most common failure points for an air-conditioned system. Maintaining an unbroken vapor barrier and utilizing economical and durable materials are best practices for combatting future condensation issues. Foil-scrim-kraft (FSK) jacketing is the most common vapor barrier utilized for duct insulation and has the same permeability as all-service jacketing (ASJ). When considering which material is best suited to your needs, cost is often an important factor. It is essential, however, to consider more than a simple side by side of materials. Some of the other factors that deserve consideration are installation efficiency, durability, thermal conductivity (K-Value), availability, and combustibility. Luse Thermal Technologies, a mechanical insulation contractor and NIA member company based in an Aurora, Illinois, recently completed work at Northwestern University in Evanston, Illinois, at Seeley G. Mudd Hall, where the University took on an ambitious project to renovate and expand the building to house state-of-the-art scientific research laboratories. 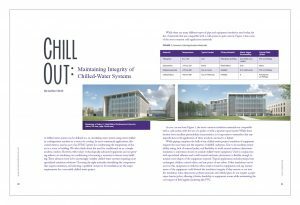 This particular project was unique for a chilled-water system because of the varying temperatures and types of chilled water utilized by the research laboratories. Operating as low as 25°F, chilled glycol lines required polyisocyanurate insulation with saran jacketing. Applying this material can be slow due to its rigidity and molded fittings. In addition, the laboratories utilize process cooling water, chilled water, and secondary chilled water, all requiring varying thicknesses of fiber glass insulation based on their operating temperatures. While the materials and thicknesses varied, the key component to insulating each of these systems was to maintain an unbroken vapor barrier on pipe, specialty valves, and equipment. The contractor also utilized a large amount of elastomeric on the valves and equipment for this project, illustrating the fact that one type of insulation is not best for all situations. The ductwork on this project was fairly standard; since they were supply ducts conveying below-ambient temperatures, they need to receive the same, unbroken vapor barrier as the pipe. This was achieved by using FSK fiber glass duct wrap in concealed locations and ASJ fiber glass board in exposed areas. A properly insulated chilled-water system should achieve the primary goal of condensation control. Condensation will dramatically accelerate pipe deterioration, create mold on pipe insulation, and possibly damage insulation throughout the system. In addition, wet insulation exponentially decreases its effectiveness. For every 1% of moisture gain, there is a 7.5% loss in thermal efficiency. While we have focused primarily on initial install in this article, note that a maintenance plan for repairing and maintaining your chilled-water insulation integrity should also involve a qualified contractor that meets the same criteria that the initial project required. While material selection certainly plays a large role in the success of a chilled-water insulation project, the craftsmen installing the products are undeniably the most important component. A skilled insulation contractor will not only deliver peace of mind, but can also finish exposed insulation that will give a mechanical room a polished aesthetic that the owner will be proud to show off. When a mechanical insulation contractor can offer the expertise to recommend materials, properly identify the scope of a project, and provide skilled mechanics to deliver a truly professional installation, success is the natural outcome.